“Capital discipline,” “improving efficiency,” “standardization,” “slowing down the project pipeline,” and various other similarly themed words and phrases abound these days in oil- and gas-related news articles and reports. Put in context, they represent how the oil and gas Industry plans to respond to what everyone believes will be a prolonged market downturn. Indeed, the last few months have been a bloodbath for the Industry. Oil prices have crashed and now hover around $48 per barrel. Company earnings reports have been dismal. What’s more, we are regularly reminded that most operators were caught by surprise. In reality, the dilemma facing the Industry today, and the practices that are being proposed to right the industry’s ship, are not all that surprising. In fact, it’s almost as if the oil and gas Industry has become habituated to commodity market swings. When commodity prices go up, the Industry goes on a spending binge, and when prices collapse, projects and resources are cut, and business leaders begin “talking” about efficiency. The story is all too familiar—companies focus more on the short term and less on the long term. While the commodity prices were on a tear, everyone succumbed to “volumes over value” and chased growth opportunities for fear of being left out or being penalized for not pursuing the newest frontier or having significant “base production” or other external influences. In many instances, as long as there was production growth, it didn’t matter what the cost per barrel was or whether we were producing the most efficient barrels, because margins were high. Now, many companies are trying to offload their stakes to save capital. Consider the technology-driven rush to pursue deepwater projects—one of those new frontiers. Operators chased opportunities in deepwater in the hopes of finding large accumulations that could be significantly accretive to their production and cash flow. Many operators, in fact, found these large accumulations. But the more important question for the long-term is whether bigger is always better? As the figure above suggests—maybe not! The figure illustrates the relationship between the estimated reservoir size (P50 hydrocarbons in place) and the profitability index (How much value does each dollar of capital generate?). The data represents real projects, contained in IPA’s proprietary Oil and Gas Databases, which are currently in various stages of planning or execution and focused only on deepwater projects globally. Most companies use the profitability index as a hurdle to decide which projects move forward and which don’t. 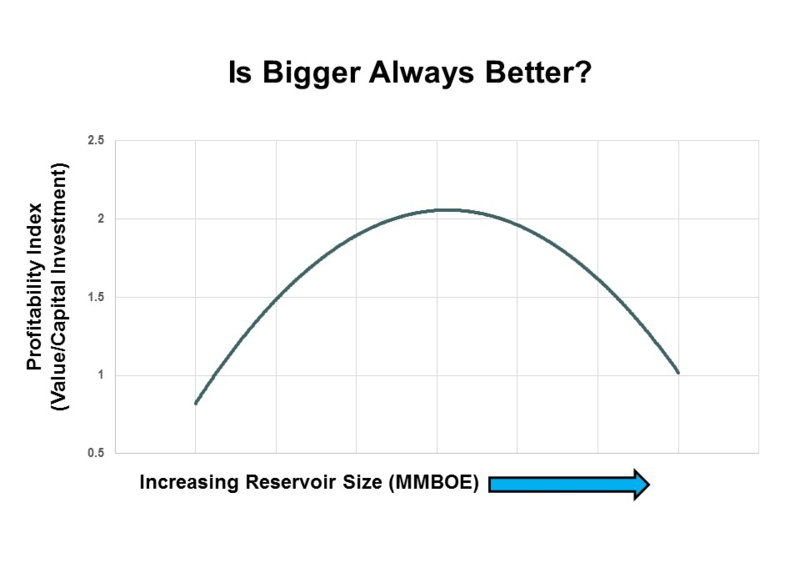 The figure shows that bigger reservoirs aren’t always the most profitable. The profitability index increases with larger reservoirs—more reserves, more production, more revenue etc.—up to a point when the capital expenditure required outstrips the gain in higher production. Beyond this “inflexion point,” larger reservoirs make a company’s portfolio increasingly capital intensive. In fact, something interesting happens as the reservoirs get larger. Very large reservoirs in deepwater require higher capital investment. Companies who use net present value (NPV) as a value metric are then driven towards building facilities for the highest peak production possible—higher production, higher revenue in early years, better NPV. Once the peak is past, the facilities often remain underused. The empirical data suggests that companies are either better off developing things just below the inflexion point or developing reservoirs to the right of the inflexion point in a phased manner. While this chart depicts the profitability index for all deepwater oil developments, similar relationships exist for each individual company’s portfolio(s). In other words, each company has its own inflexion point that needs to be assessed and understood. A company’s specific inflexion point depends on its ability to deliver projects relative to its peers. This should then be a basis of dialog among the Executive Leadership, Strategy, Exploration, and Development functions to reach alignment on where the company should focus, given its delivery capability. If a company delivers very competitive projects—lower denominator in the profitability index—it can probably afford to develop larger reservoirs relative to a company that delivers projects less competitively, ceteris paribus. Such an informed portfolio analysis, which marries strategic (portfolio) issues with tactical realities (project delivery) should then be the basis to decide other long term efficiency initiatives. As companies focus their attention on becoming simpler, leaner, and more efficient, they should also ask themselves, “Which reservoirs and opportunities should we really chase? What is the optimal range of reserves that we as an organization—with our technologies and core competencies—can profitably exploit?” Such a forensic diagnosis will allow companies to streamline their portfolios in a systematic manner, which is the first step towards capital efficiency.